The G6 Rhino is named after the indigenous African Rhinoceros, an animal which is massive in size and extremely powerful stationary and even more so when charging a threat. Armed with a long protruding horn on its snout, a rhino can devastate any attacker. Unlike its animal namesake, the G6 Rhino is agile for its bulk. As with many indigenous South African military vehicles, the G6 Rhino was designed and produced when South Africa was under strict international embargo because of its segregation policies, known as the “apartheid”. 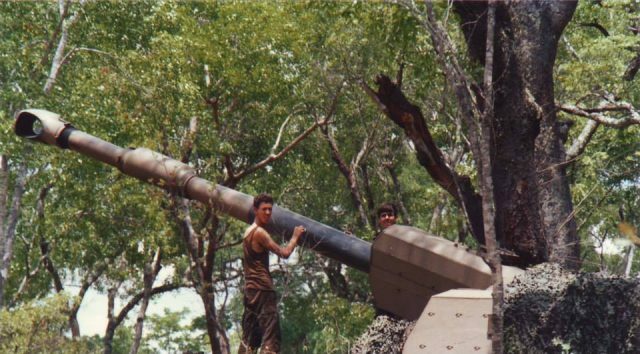 The G6 was planned at the height of the Cold War by South Africa to replace its ageing WW2 artillery pieces to counter Eastern Bloc supplied artillery used by Popular Movement for the Liberation of Angola (MPLA) and People`s Armed Forces for the Liberation of Angola (FAPLA). 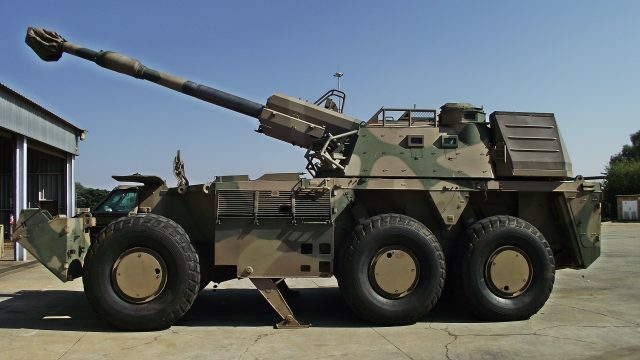 The Rhino G6 is a three-axle, six-wheeled self-propelled howitzer vehicle which forms the backbone of the South African National Defence Force (SANDF) artillery arm who can field 43 vehicles. The SANDF actively operates nine G6-45 vehicles while the remaining 34 are in storage during peacetime. Characterised by its impressive fire range, mobility, speed, accuracy and endurance, it remains at the front of the pack when compared to other wheeled and tracked self-propelled howitzer vehicle. 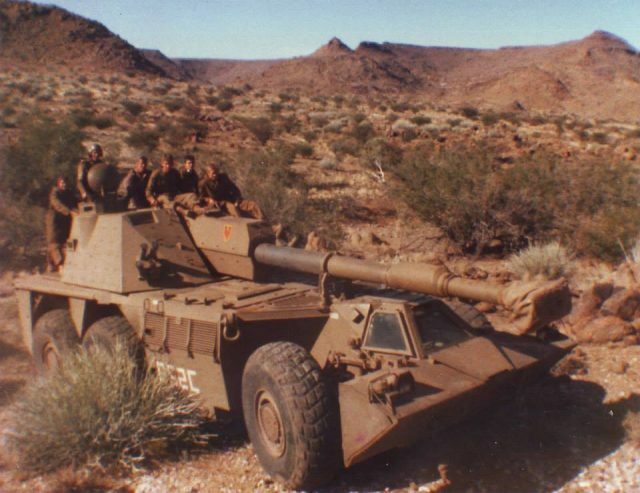 During the 1960`s, the South African Defence Force (SADF) still employed WW2 artillery such as the 88mm quick-firing gun (25-pounder) which was designated G1, 140mm howitzers designated G2, Canadian M2 155mm towed howitzers designated G3, and the Sexton self-propelled artillery to name a few. Needless to say, the SADF needed to upgrade its artillery inventory. Artillery gunners set the requirements to modernise their artillery inventory in 1968 which was formalised during 1973. Development of the G5-45 155mm advanced long-range field artillery system (known as the Leopard) began in 1976 under the project name Sherbett III, led by the Space Research Corporation under the famous Dr Gerald Bull. The responsibility for the design and development of the G6 carrier and turret was allocated to Sandock Austral and Ermatek. The integration of the G5-45 155mm advanced long-range field artillery gun control system into a turret was the allocated to ESD. Littleton Engineering Works (LIW) produced the turret which was designed by Emetek. Naschem was responsible for ammunition sub-systems. The G6 Rhino is armed with the G5-45 gun and designated as the G6-45. A G6-52 version is currently undergoing advanced development by Denel Land Systems. 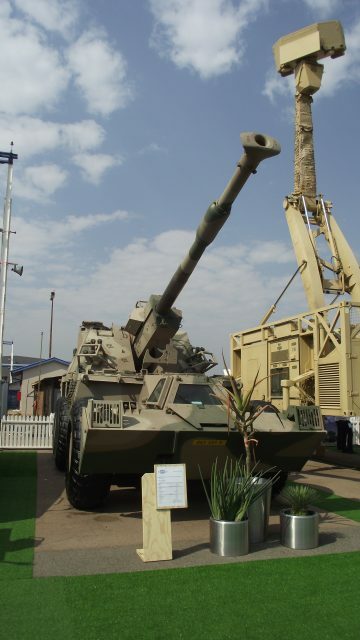 The development of the G6-45 self-propelled gun-howitzer began in earnest during 1979 at ARMSCOR under Project Zenula. The first advanced prototype was completed in October 1981 and by 1987 four G6-45 vehicles were built. They were pushed into service in the same year during the Angolan Border War (1968-1989). One G6-45 vehicle suffered an engine failure due to a broken connecting rod on one of the pistons. It was subsequently was towed to Mavinga while a new replacement engine was flown in. Three days later, after the new engine was installed the vehicle set out to join the other three G6-45 already deployed in the bush. All four vehicles returned to South Africa on their own power near mid-December 1987. The G6-45 sports a low-silhouetted hull fitted to a 6×6 wheeled romp designed and optimised for the distances and terrain it would operate in, which can be described as some of the most hostile in the world. The G6-45 is characterised by its six massive wheels, fast setup time, bush breaking ability and versatility as a howitzer platform. In skilled hands, during the South African Border War, the G6-45 proved itself more than capable of inflicting heavy losses and dictating enemy strategy. The G5 was designed with a secondary self-defensive direct anti-tank role in mind. It is thought that it could defeat any composite armoured MBT of the time. Conversely the same is true for the G6-45. It came as a nasty surprise to FAPLA, as it dominated the battle space by outshooting, outranging and outmanoeuvring enemy artillery. The G6-45’s 6×6 wheeled configuration is designed for the African battle space and characterised by its flexibility and cross-country ability. The large distances in Southern Africa and low force density necessitated a vehicle that could operate on its own power. The wheeled configuration subsequently grants the G6-45 strategic mobility, as it does not require heavy transport or trains to reach its destination. This was in line with SADF doctrine that called for mobile warfare. The vehicle makes use of a central tire-inflation system which controls the six-run flat (designed to resist the effects of deflation when punctured) radial tyre configuration. This offers more reliability and requires less maintenance than tracked self-propelled howitzer vehicles such as the American M109 and Warsaw Pact 2S19 Msta. Wheeled vehicles have a great strategic advantage when compared to their tracked counterparts, as they are between 40-60% cheaper, have a 300% longer service life, use 60% less fuel and maintenance intervals are between 200-300% longer. Additionally, wheeled vehicles also require a smaller power pack to achieve the same performance as a similar tracked vehicle. Tracked vehicles are much more susceptible to landmines which detracts and immobilises them whereas a wheeled configuration can be repaired more easily. The G6-45 can lose a rear or middle wheel and still remain maneuverable over rough terrain. Such advantages, however, come at a cost. In order for wheeled vehicles (above 10 tonnes) to achieve acceptable cross-country mobility, overall large size and high levels of mechanical complexity are required when compared to tracked counterparts. The G6-45 makes use of a German manufactured Magirus Deutz BF12L513 FC V12 air-cooled diesel engine which produces 477 hp. Compared to other wheeled artillery howitzer vehicles, it is uniquely located in-between the driver’s compartment and that of the crew compartment. The turret bustle contains a two-cylinder air-cooled four-stroke Deutz F2L511 22 hp engine Auxiliary Power Unit (APU) with which the batteries are recharged and air-conditioning units are powered for crew compartment. The drivers compartment air-conditioning is power by the main engine. The G6-52 features an upgraded 50hp turret mounted APU engine. 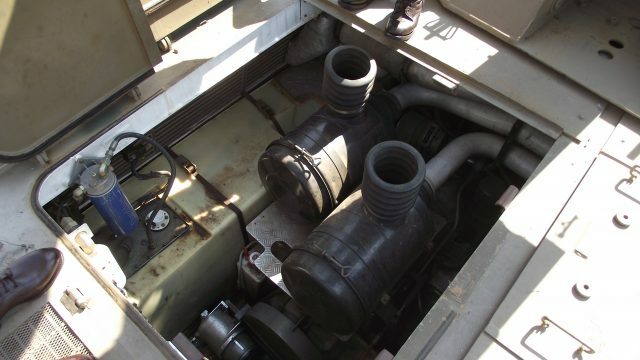 The G6-45’s electrical system consists of two 24-volt batteries that provide 175-ampere-hour for the hull while four 12-volt batteries provide 390-ampere-hour for the turret. The G6-45 makes use of a BAE Land Systems OMC automatic gearbox (RENK family of gearboxes) with six forward and one reverse gear ratios. The gearbox can be manually overridden if the need arises. The vehicle features a permanent 6×6 drive configuration with selectable longitudinal and differential lock. The steering is hydraulically assisted. Torsion bar suspension units with hydraulic shock dampers and bump stops are located on all six wheels. Its 6×6 wheeled configuration offers great operational and tactical mobility. Despite its size, the G6-45 has an operational range of 700 km via road and 350 km over rough terrain, allowing flexible force movement in conjunction with mechanised formations. Although the G6-45 can reach road speeds of up to 100 km/h, its cruising speed is 85 km/h while off-road speeds of between 30 – 60 km/h can be maintained depending on the terrain. 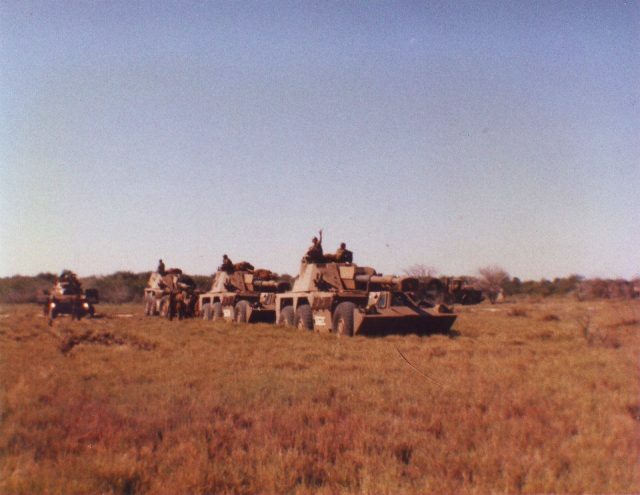 As proven during combat operations during the South African Border War and in accordance with SADF/SANDF doctrine, the G6-45 can operate on long missions’ cross-country over rugged and variable terrain, bush-break new supply routes and provide superior long distance artillery support for nearly a month with very little technical and logistical support. Improvements made to the G6-52 chassis have simplified maintenance and lengthened the periods between service intervals. Army-guide.com. 2012. The G6 -Still outgunning the competition. Date of access: 12 Apr. 2017. Camp, S. & Heitman, H.R. 2014. 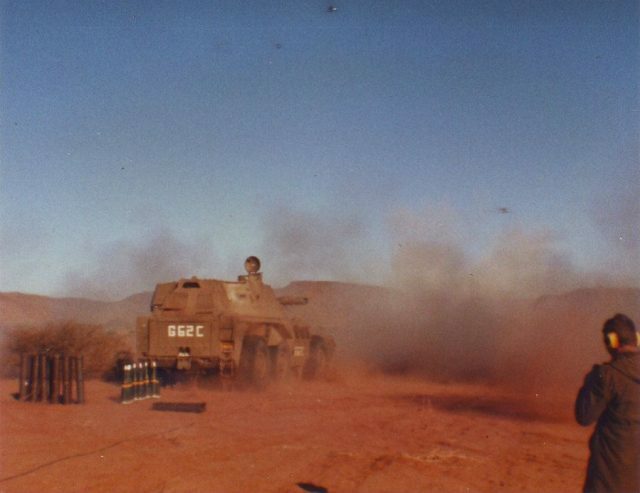 Surviving the ride: A pictorial history of South African manufactured mine protected vehicles. Pinetown, South Africa: 30° South Publishers. Defenceweb. 2011. Fact file: G6 L45 self-propelled towed gun-howitzer. 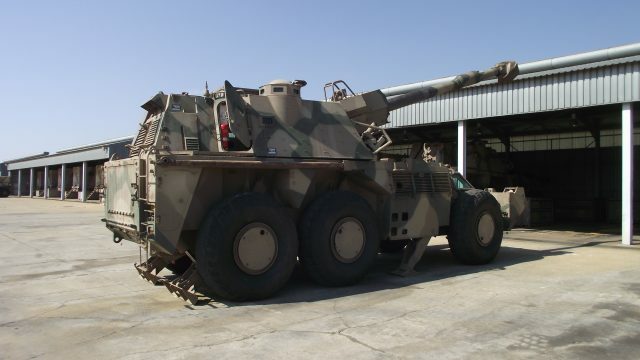 http://www.defenceweb.co.za/index.php?option=com_content&view=article&id=13537:fact-file-g6-l45-self-propelled-towed-gun-howitzer-&catid=79:fact-files&Itemid=159 Date of access: 18 Apr. 2017. Denel. 2012. The G6 – still outgunning the competition after 25 years. http://admin.denel.co.za/uploads/41_Denel_Insights.pdf Date of access: 25 Apr. 2017. Harmse. K. & Dunstan, S. 2017. South African Armour of the Border War 1975-89. Osprey: Oxford. Military Factory. 2017. Denel GV6 Renoster (G6 Rhino) 6×6 Wheeled Self-Propelled Artillery (SPA). http://www.militaryfactory.com/armor/detail.asp?armor_id=436 Date of access: 8 Apr 2017. Ordnance & Munitions Forecast. 2015. G6 Renoster 155mm Self-Propelled Howitzer. https://www.forecastinternational.com/archive/disp_pdf.cfm?DACH_RECNO=1105 Date of access: 8 Apr 2017. SANDF personnel. 2017. G6-45 [personal interview and vehicle inspection]. 25 Apr. School of Artillery Klipdrift Military Base, Potchefstroom. Steenkamp, W. & Heitman, H.R. 2016. Mobility Conquers: The story of 61 mechanised battalion group 1978-2005. West Midlands: Helion & Company Limited. War in Angola. 2017. Vehicle specifications, 4:14.
http://www.warinangola.com:8088/Default.aspx?tabid=1051 Date of access: 8 Apr 2017. The G6-45 is manned by a crew of six consisting of a commander, layer, breech operator, loader, ammunition handler and driver. During an engagement, the ammunition handler and driver prepare and load the ammo from the outside rear to the loader inside the turret. The driver’s compartment is located at the front-centre of the vehicle between the two front wheel wells. The driver has day/night viewing capabilities and an excellent 180-degree field-of-view through three large bullet-resistant windows. During a battle, the driver can activate an armored shield which pops-up and covers the front window for extra protection. When the armored shield is activated, the driver uses a day periscope with a view of the front to drive. Located behind the driver is the gearbox and engine (power pack). The driver can only enter and exit the vehicle through a roof hatch located above his seat. The driver’s station contains a comprehensive engine monitoring system. The turret is mounted at the rear of the vehicle hull, above the two rear axles and is manned by the commander, layer, breech operator and loader. It features several viewing ports, Gyro laying sight for indirect fire and telescope for direct firing. The commander and breech operator are located on the right side of the ordinance while the layer and loader are seated on the left. The commander’s station has basic driving controls from where he can switch off the engine and apply an emergency brake to stop the vehicle. He also has access to a cupola which offers 360-degree viewing as well as roof hatch. A pintle-mounted 7.62mm or 12.7 mm machine gun can be mounted on the left-hand side roof hatch. The machine gun’s primary function is to engage low flying enemy aircraft, lightly skinned armored vehicles and suppress enemy infantry. Up to 2000 rounds of 7.62 or 1000 rounds of 12.7 mm ammunition can be carried aboard. The rear-right of the turret features a hatch for crew access. A dedicated hatch for ammunition loading is located at the rear-centre of the turret, near the floor. Two banks of four 81mm electrically operated grenade launchers (smoke) are located on either side of the front of the turret. The turret also has five firing ports (two left, two right and one rear) should the crew be forced to use their R4 rifles for close-in defence. The G6-45`s primary armament is a 155mm-L/45 main gun while the G6-52 uses a longer 155mm-L/52 main gun. Much of the early long distance shooting success of the G6-45 was due to its blast chamber having a volume of 23 litres, as compared to the international 21 litres. The G6-52 also features a 23-litre blast chamber. The G6-45`s 155mm gun uses a single-baffle muzzle brake and an upgraded hydro-pneumatic recoil system and rammer which grants it three rounds a minute rate of fire. The G6-52 features a barrel cooling fan system, a modified multi-baffle design and a new rammer which increases the rate of fire to six rounds per minute. The G6-45 breech mechanism features an interrupted screw stepped-thread while the G6-52 makes use of a combination swingblock with mushroom head and sliding block. The elevation is maxed at +75 and -5 degrees with a traverse of maximum 40 degrees either left or right horizontally from the centre. The G6-45 carries a total of 39 rounds (155 mm), 50 charges, 60 primers and 39 fuses (plus 18 backup fuses) are carried (as standard) in racks located at the interior rear of the chassis. The G6-52 makes use of a carousel with 40 projectiles and 40 charges. The 19 rounds carried inside the turret are for emergency use only, while the 8 rounds stored in the nose of the vehicle and the 12 rounds stored in the outside fighting compartment of the turret in special blast out magazines (for the charges) are used first when in a stationary firing position. All ammunition used by the G6-45 was developed in South Africa and supplied by Rheinmetall Denel Munitions. The G6-45 can fire all standard NATO 155mm ammunition as well as the M1 series Extended Range Full Bore (ERFB) and Extended Range Full Bore-Base Bleed (ERF-BB) ammunition. The G6-45 and 52 make use of the M64 Modular Charge System (MCS), the latter achieving a velocity of 909 m/s (HEBB) or 911 m/s (HE). 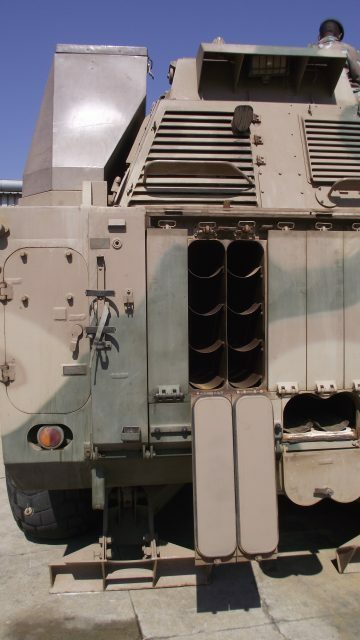 Of note is the M9703 Velocity-Enhanced Long-range Artillery Projectile (V-Lap) which combines base-bleed and rocket motor technology developed under the Assegai project. The G6-52 Extended Range (ER) has achieved a range of 70km by combining the M64 MCS and V-Lap. Note: All firing ranges are at sea level. The fire control system of the G6 is indirect in nature, as targeting data originates from forward observers, who pass it on through the Artillery Target Engagement System (ATES) to a fire control post before finally being transmitted to the individual G6 Launcher Management System (LMS) via frequency-hopping Very High Frequency (VHF) radio. The G6-45 layer can only aim the ordinance via a telescopic sight for direct-fire missions while the G6-52 makes use of an automatic gun-laying system. The G6-52 features an automatic fire-control system (AS2000) which includes an automatic gun laying and navigation system (FIN 3110 RLG) designed by BAE Systems. The G6-52 features a new Launcher Management System (LMS) computer integrates the fire control computer system, GPS receiver and the ring laser gyroscope with a touchscreen display and DLS sensors. This, among others, enables the G6-52 to launch multiple round simultaneous impact fire. This involves the firing of several shots at different arcs towards a target so that they impact at the same time which ensures maximum surprise as shells impact their target at the same time. This can be done up to a maximum range of 50km. Although the G6 is capable of firing from a wheeled stance, it is equipped with four hydraulically operated stabiliser legs two of which are located between the first and second wheel pairs and two located behind the rear wheels. These can be deployed for optimal stability. The G6-45 can deploy to fire in under one minute and can be mobile again in the same time which allows for a quick ‘shoot and scoot’ tactics, making it difficult to locate, target, and hit for example with counter battery fire. The G6-45 features an all welded steel alloy armor which provides protection from small arms fire, ballistic fragments (shrapnel) and explosive concussion across the whole chassis. The frontal arc of the vehicle and turret offers protection from 23mm armor piercing rounds at 1000m, while the sides and rear are vulnerable. 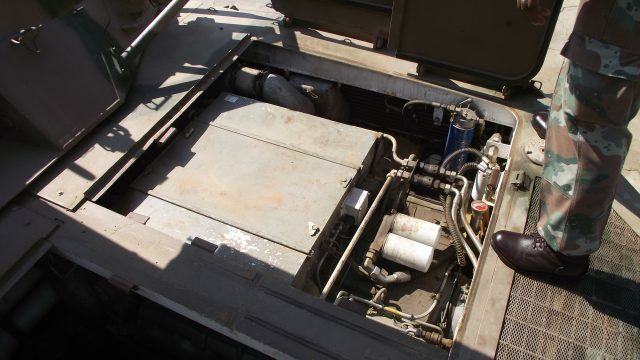 As with most South African produced military vehicles, the chassis is mine protected, with the floor of the vehicle being double layered for improved protection. This allows the G6-45 to withstand three TM46 anti-tank landmine explosions. The G6-45 incorporates an overpressure biological and chemical protection system while the G6-52 offers full nuclear, biological and chemical (NBC) protection system. It was during the South African Border War that three preproduction vehicles experienced their baptism of fire as part of Operation Modular in 1987. Designated Juliet Troop under the command of Major Jakkie Potgieter, the three G6-45 preproduction vehicles accompanied by a team of civilian technicians travelled under their own power from Potchefstroom Artillery School (South Africa) to their designated assembly area in northern Namibia, a journey of nearly 2500 km. There, they joined the expeditionary troops of the 4th South African Infantry Battalion (4SAI). 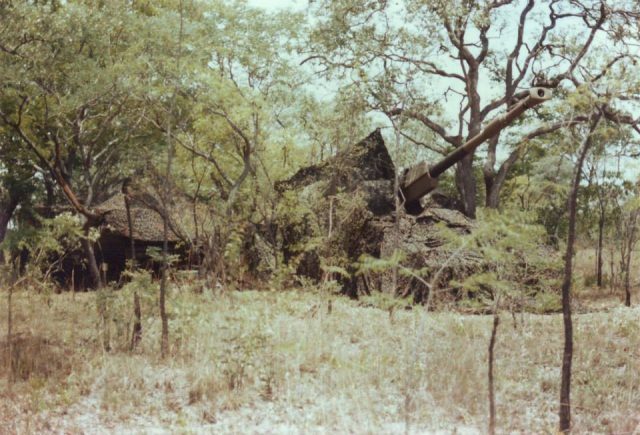 Operating independently as a battery, the three G6-45`s bombarded strategic MPLA and FAPLA military targets. Of note is one instance where an airfield near Cuito Cuanavale was targeted. With special forces (Recces) serving as forward observers, accurate fire missions were given to the G6-45`s which subsequently destroyed four Angolan MIG-21s` taxiing for take off. Subsequently, the MPLA was forced to withdraw their aeroplanes to airfields further away and out of the G6-45 fire range. The end result was that MPLA aircraft had to fly further to execute their aerial mission and subsequently couldn’t spend as much time searching for targets. Few would disagree that the G6-45 was ahead of its time when it was first fielded in 1987. It subsequently proved its combat capabilities during the South African Border War and more recently when G6 variants were fielded by UAE armed forces in Yemen in August 2015. The original objectives of long-range fire, speed, mobility, flexibility and easy logistics are complemented by the G6`s overall crew protection. Through continued upgrades, the G6`s can remain a force to be reckoned with within the field of self-propelled howitzer vehicles (which are actually fielded) in the foreseeable future. For the caliber gun, the vehicle is quite small and light. Enjoyed reading this outstanding article. Very effective weapon, but how is it with cross-country ability? I think the wheeled chassis is not the best choice. Hi Alexsandr. Thank you for the question. It would be an interesting test to put the G6 against a tracked vehicle and test its mobility under identical circumstances. The G6 wheeled chassis is the staple layout of the SADF/SANDF due to low force density, the large distances that it needs to travel on its own power and operations with little or no logistical support. The G6 cross-country capability is more than adequate for the African battlespace and has been battle tested. The interviews I had with the crews revealed that they were more than satisfied with their vehicle. Hello Dewald Venter, I approximately and understood, having familiarized more in detail with characteristics of this car. For this area, the wheeled chassis fully meets the requirements of this ACS requirements. It is necessary to note once again the outstanding characteristics of this system, incl. Dynamic qualities are impressive – with a weight of 47 tons, the average off-road speed is over 30 km / h! This is very impressive. Well, the characteristics of the gun itself are very serious. Range of fire max 50 km (shell projectile V-LAP)! Few systems in the world are capable of this. That tests on the tank chassis were carried out. I wonder which chassis was used? Centurion? I`ll try and find out. Hi Alexander. The chassis used for the T-6 prototype was in fact that of a T72 MBT. Not Centurion or Olifant as some believe. Hope this helps. many thanks Dewald for a comprehensive accurate report. This article is very extensive in its coverage but it seems to omit any references to the G6 variants developed by Chile and Iraq. Hi Danny. The article only covered operational G6 variants. The Chile version never made it past testing. The Iraqi G6 was never pushed into service with only one being built. I had the priviledge and the pleasure to be one of the G6-45 key–designers and I found your article to be very accurate within my field of expertize. A few minor inaccuracies could be disregarded. Please feel free to give my e-mail address to H.R.Smith, if he is the same person I used to work with during 1979–1981 in South Afrika. I`m glad you enjoyed the article. Feel free to inbox me on Facebook with suggestions on ways to improve the article. I’ve passed your message on to Howard.